There has been a lot happening in the Dining Room since you last visited and I can’t wait to show you how it’s developing. We have been working very hard to bring the room to life and this week I’ve been focusing on the Lighting. If you read the blog yesterday you’ll know that we’ve added a wall mural which has really given the room a focal point and a bit of ‘wow factor’. I must admit I’m still getting used to it and it still has the ability to shock me everytime I walk into the room!. As the wall is very dramatic and bold I’ve been wanting to keep the rest of the decor quite fresh and simple but still keeping it fun and inviting. It is after all a room for all of the family to enjoy, and it needs to be flexible enough for us to live in it comfortably. It is our home and I don’t want it to be sterile and stark. The Lighting I’m using in the Dining Room has been kindly provided by NEXT, continuing our partnership on this series of posts. I am a big fan of using lighting to its best advantage in a room, and if my budget had stretched to it I would have loved to have added some wall lights. Unfortunately it didn’t this time so I’ve experimented in different ways. A key theme that I’m featuring in the Dining Room is Texture, and I’ve looked at this with the lighting too. The room needs plenty of light as the girls like to play in here, colouring and playing games and of course, we need the right lighting for when we’re eating in the evenings. 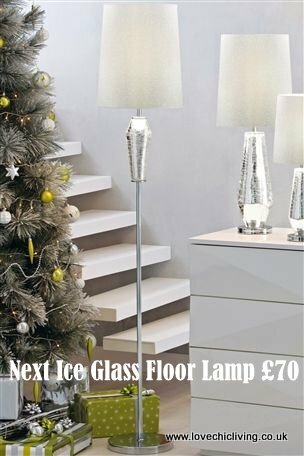 I’ve chosen the Ice Glass Floor Lamp (£70) to begin with to give a warm glow in the corner of the room. I love the crackle glass detail on the stem and the sparkle shade too. Take a look in the video to see how this looks at night. To continue the look I’ve also chosen an Ice Glass Table lamp (£28) and popped this on a shelf on the other side of the room. We are short on display space in this room so adding the shelf has given us extra options. 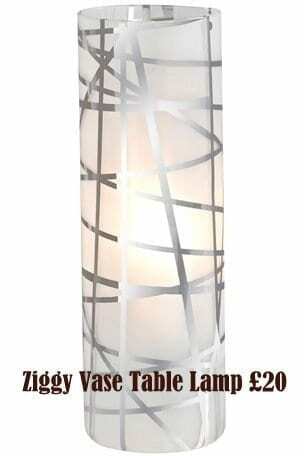 To complete the look with icy, crisp textures and light I’ve also gone for the Ziggy Vase Table Lamp (£20) which will act as a good looking accessory and give a good glow in the corner of the room, although this one is yet to take its rightful place. 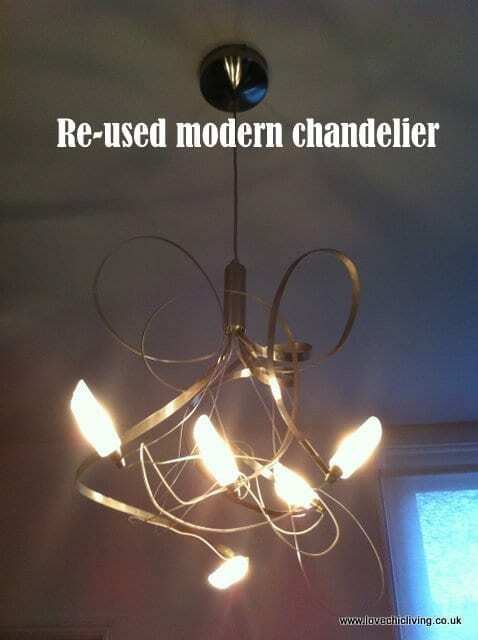 The modern chandelier ceiling light is a hangover from the last time we decorated, but I still love it, and it’s still on trend so I’ve decided to save a little money and keep it going in this scheme. 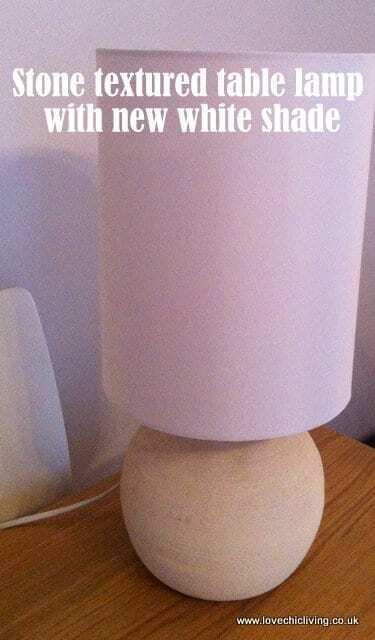 I’ve also recycled another lamp base I found lurking in the loft. It’s a stone base, again adding a bit of texture, and I’ve just added a more modern new white shade. We also have a few directional lights above the bookcases which really light up this area and highlight the mess the features of the corner! And so over to this week’s film showing what changes we’ve made to the room in the last fortnight and how it is starting to come together. I’ve filmed some of it at night to give you an idea of how the effective the lighting is. And now it’s over to you. Would you like to link up and show us the fabulous things you’ve found for, or been changing in, your home? 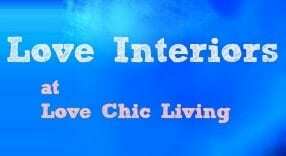 The Love Interiors Linky is open to you if you’ve written about your home, if you’ve found something fabulous on the internet or even if you’ve reviewed a lovely interiors product. Link it up here so we can all share the love. Do comment on at least one other post, and grab the badge from the sidebar too. Thank you to Next for providing the lighting for this Makeover post. The comments are honest, genuine and my own. Do come back next time when we’ll be looking at textiles, cushions and rugs! It looks brilliant, love that it looks so bright and airy….but cosy in the vending with the lighting. Result! Thank you, we’re using it more and more now so I’m really glad that we’ve gone to all the effort to change it! And thanks for linking up! Well done, it’s looking great! I love the wall mural in particular, very effective.